Born in 1946, at an outpost camp on Elsie Island, north of Inukjuak. As a teenager, Echalook was encouraged to carve by his uncle, Lucassie Echalook. Family members, including his uncles, Lucassie and Thomassie Echalook. Echalook’s prints depict scenes from the past, including hunting and fishing. “His early carvings were small-scale renditions of fish, bears, otters, geese, and weasels” (Fox 1997:10), while his later work focusses on women engaged in domestic activities. He has also depicted Inuit stories in his carvings. One, simply entitled A Legend, shows a woman pulling on a noose looped around a bird’s head. Echalook gave this description of the work: “A vulture tried every way he could think of to get an Eskimo wife for himself, but without success. The woman also tried different ways to kill him” (ibid 11). “Echalook’s work is recognized for what has been described as ‘super-realism,’ a technique whereby his figures’ body and facial features are slightly exaggerated and distorted, but without relinquishing meticulous attention to detail. . . . Generally, his figures have highly expressive mouths and elliptical eyes” (Fox 1997:10). Commenting on this technique, art historian Ingo Hessel says that, “Echalook follows the older convention of inlaying facial features with contrasting ivory, using these materials for greater realism, but, also, expressively for psychological impact” (1998:80). When he was 21 years old, Echalook demonstrated carving for two months at Expo ’67 in Montreal. 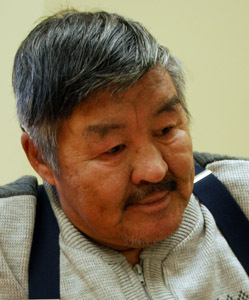 In 1972, he and his uncle Thomassie participated in a print workshop conducted by Bob Paterson in Puvirnituq. Upon their return, they transformed an abandoned portable classroom into a print studio, where Echalook was involved in printmaking until 1976. 1997 “Curator’s Choice: Noah Echalook and Simeonie Elijassiapik,” Inuit Art Quarterly (IAQ), vol. 12, no. 4 (Winter): 10–15. 1998 “Sculpture: Traditions and New Directions,” Inuit Art. Vancouver/Toronto: Douglas & McIntyre.